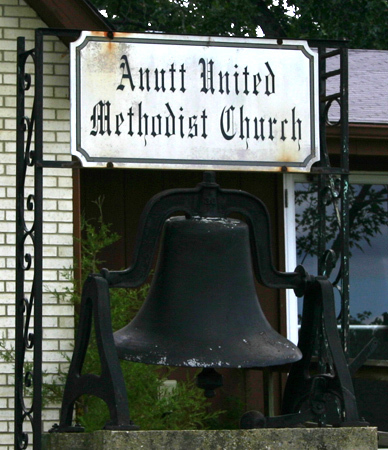 Directions: This cemetery is located on a gravel street one block east of State Hwy O, and two blocks north of State Hwy C in Anutt, behind the Anutt Methodist Church. Pronounced by the locals as ah-NUT' (as opposed to AN'-nut), this cemetery is a very well-kept cemetery, and very enjoyable to wander. If you're lucky, you may see a couple of local young hound dogs that will keep you company as you wander... they are delightful, they love to be petted and they wouldn't hurt a flea. I enjoyed them immensely as I took pictures of gravestones. One even snatched up some old faded flowers that were displaced and brought them to me, and seemed to say "hey, found some flowers that blew off a grave, what do I do with 'em?" They were so sweet.